Aquarius time brings the time of year that’s good for learning about detachment and philanthropy. The Sun leaves Capricorn and enters Aquarius around January 21 each year. This shift brings all of us new opportunities to discover the truth about ourselves and dream new dreams for an ideal world. When the Sun travels through Aquarius each year, it brings an electric, airy energy that inspires us to cultivate new hope as we dream of a better, kinder world. Thanks to this sign’s association with inspiration and even genius, the Sun’s journey through Aquarius can bring us new insights for solving life’s problems creatively. It also can help us see ourselves and our purpose in new ways. Although Aquarius symbolizes the self’s uniqueness and independence, this sign also is associated with friendship; Aquarians, typically friendly, tend to have many acquaintances but need to remember that the most important friendships are those with our inner self and the divine unity. Aquarius also is linked with humanitarianism because Aquarius’s nobler energies help us to help others in a selfless way. They also remind us that all are sisters and brothers, part of humanity’s great “siblinghood.” As such, we are called to help one another by expressing our uniqueness and giving the gifts that only we can offer. Aquarius’s ruling planet, Uranus, is famous for its beautiful sky blue and turquoise color. These colors offer a clue to Aquarius’s element, which is air, and reinforce this sign’s detachment and strongly intellectual approach to life. In addition, Uranus has a tipped rotational axis, which causes the planet to spin on its side. (Imagine how things would appear if you looked at them sideways.) This fact corresponds to Aquarians’ tendency to look at the world in unique ways, to march to the beat of their own drummers, and to embrace difference and even strangeness in others. The Aquarian symbol, the Water Bearer, presents us with a human figure who holds a large vessel from which water flows. The figure is androgynous, indicating the original spiritual unity of female and male energy. The water represents wisdom, which flows freely and impersonally to benefit all creation. The water also reminds us of the need for compassion in order to avoid Aquarius’s tendency to emotional coldness and the need for friendship to prevent alienation and isolation. Despite its Water Bearer symbol, Aquarius is an air sign. In fact, it is associated strongly with the sky because its planet, Uranus, is named for Ouranos, the ancient Greek sky god. This sky imagery also gives us Aquarius’s association with electricity–both physical and spiritual. Just as an electrical storm can bring lightning flashes in a darkened sky, we may experience Aquarius’s power on the spiritual plane as sudden awakenings or flashes of brilliance. 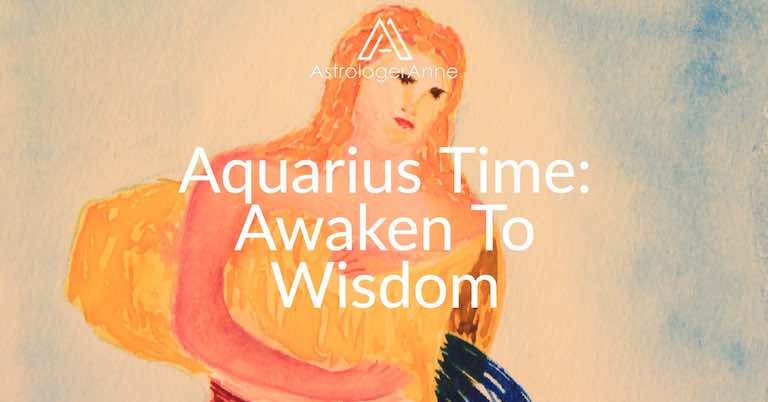 We can make the most of Aquarius time each year by caring for our nervous systems with good nutrition and plenty of rest and grounding any electrical flashes of insight or ideas by jotting them down immediately so they’re available for future reflection. During each year’s Aquarius time, we feel strong impulses to define what utopia–a place of ideal perfection–means to us and imagine ways to manifest our vision. Each astrological sign is associated with a phrase, and for Aquarius that phrase is “I know.” This energy can be expressed negatively if we assume we know best and try to impose our vision of utopia on others or if we rely only on information gained from outer sources or authorities rather than trusting our inner knowing. At its best, though, “I know” represents an inner, spiritual knowing or “gnosis” gained from inspiration or intuition and verified via reflection, meditation, and personal experience. Now is the time to tap your inner wisdom. You have the ability to find your inner waters and the obligation to drink deeply and share what you know to help others. If you will take up this task, you will come to know why Aquarius’s ruler, Uranus, the mythical god who rules the vast sky, is known as the Great Awakener. Tune in even more to the Aquarius zodiac sign with the Aquarius Meditation.